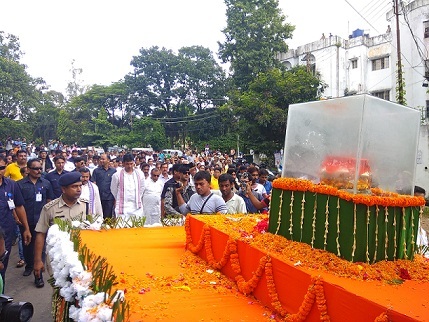 The ‘ashti kalash’ containing the ashes of the former Prime Minister Atal Bihari Vajpayee reached Tripura (from New Delhi) on Thursday with the Chief Minister (CM) Biplab Kumar Deb receiving it at the Maharaja Bir Bikram Airport in Agartala. Deb – along with his ministerial colleagues – received the urn with full State honours and the BJP State General Secretary Pratima Bhowmik was also present. Ministers Ratan Lal Nath, Sudip Roy Barman, Pranajit Singha Roy, Manoj Kanti Deb, Santana Chakma, party functionaries and thousands of party workers and supporters gathered at the airport to witness the event and pay respect to the Late Prime Minister. Hundreds of students and common people stood by the road side to pay their respect to Late Atal Bihari Vajpayee, a political doyen. A car and bike procession along with the urns reached the circuit house Gandhi statue area from where the CM, ministers, party leaders and workers walked with the ‘ashti kalash’ to the party headquarters chanting the slogan ‘Atalji Amar Rahe’. Hundreds of people also gathered at the party office to pay their last respect. For the next two days, the urns shall remain at the party headquarters so that the people could pay their last respect to the departed soul. After that, the ashes would be immersed in eight rivers of the eight districts of Tripura on August 26 next.